Of course there were a few other winners, but that’s not the point. Let’s take a look at the tool. As simple as a haiku, Fix It Sticks features minimalist aluminum shafts with a tool bit at either end. A pair of sticks gives you four permanently mounted tool bits. Each stick also has a hole in the middle to accept the other stick, making the combination a useful t-handled tool. It’s a head-slappingly simple design and the first tool I’ve bought (admittedly, by the sweat of my poet’s brow) in a while that I’ll pull out of the bag just to show off. Davis, the inventor, says one of his favorite shop wrenches is a three-way. Fix It Sticks is his way of delivering the torque potential of a three-way in an easy-to-carry form factor. For $29.99, you get a pair of Fix It Sticks in one of four popular tool bit combinations. There’s a bit of a break on the price if you buy two pairs of sticks at once. Davis asked me what size bits I wanted, and I asked for 2, 4, 5 and 6mm allen wrench fittings. This is a custom set-up that costs $35. You can also buy custom sticks individually, plus Davis makes a Torx arrangement and a set specifically for snowboarders and skiers. In any case, Fix It Sticks supplies the torque I need. Could I use individual allen wrenches or a folding multi-tool instead? Sure, I have before. 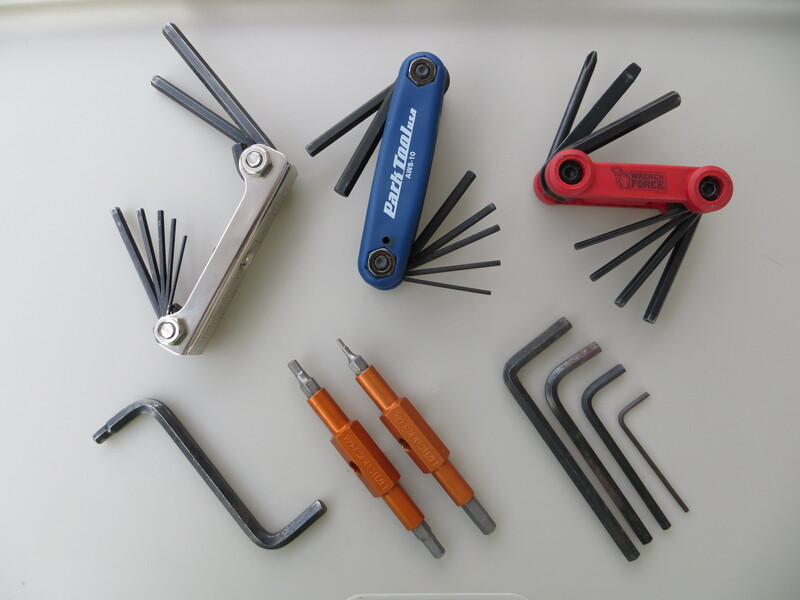 But individual allen wrenches are easy to lose, and a folding tool has to be, well, folded and unfolded. I like the immediacy of the Fix It Sticks arrangement: hold the sticks up, find the correct end, insert the end in the bolt or screw, slide the other stick in place and adjust. Is Fix It Sticks right for you? Depends. If you’re running a fixed-gear bike with 15mm axle nuts and 8mm crank bolts, and you like all-in-one solutions and being prepared for anything, a set of Fix It Sticks will sadly fall short of the mark. 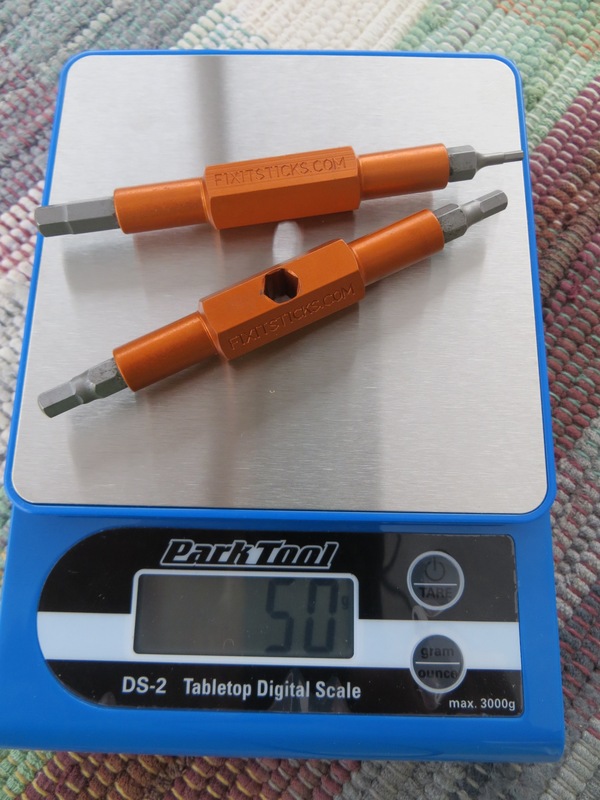 Custom sticks aren’t available in those sizes, and even if they were, the torque loads involved might destroy the tool. 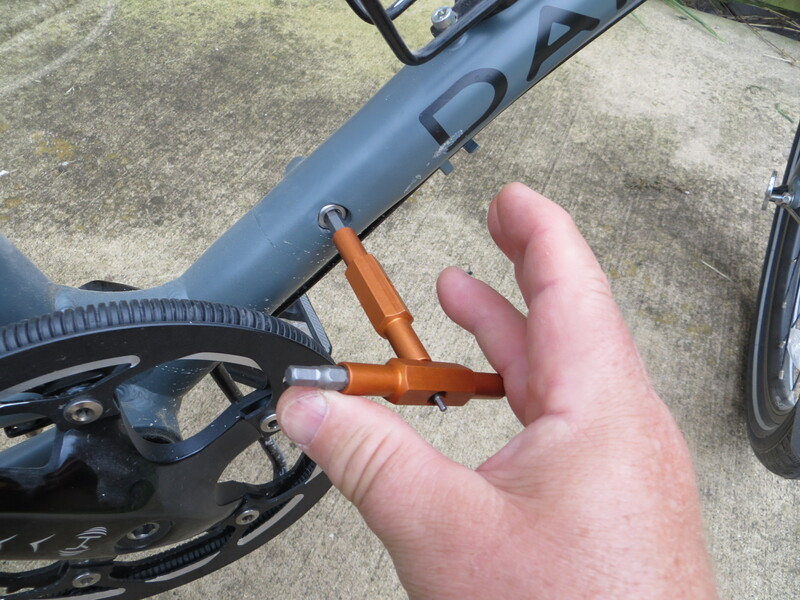 On the other hand, if you don’t plan on overhauling your bicycle on the road but you want a lightweight, easy-to-use tool for seat angle and height, handlebar rotation and height, cleat adjustment, and general brake and derailleur fiddling, Fix It Sticks could be a good choice. Though I’d still recommend carrying a spare tube, patch kit and tire irons at a minimum. And a chain tool and a spoke wrench, if you know how to use them. Weighty comparison, clockwise from top left: Eklind, 134g; Park AWS-10, 105g; Trek Wrench Force, 113g (includes 6mm socket); loose wrenches, 58g; Fix It Sticks, 50g; Raleigh 5/6mm, 32g. Compare to an empty short wide-mouth water bottle at 81g, which makes an especially lousy tool. Fix It Sticks does have a few drawbacks. First, there’s always a tool bit that protrudes past the stick you’re using as a handle; you don’t want to palm the tool. Second, nothing holds the two sticks together except your hand; pay attention when you’re working or you’ll be playing pick-up sticks. Fourth, the tool bits are always exposed, which means you want to be careful about storage. Nothing can ruin your day faster than losing a stick on the road or trail because it drilled a hole in the pocket of your favorite jersey. And finally, I just haven’t had it long enough to judge the ultimate durability of the aluminum/steel design. But those are drawbacks and an unknown for the rational mind, and Fix It Sticks, while quite functional, is primarily for the reactive mind. You see the tool, its light weight and simplicity, and you get it. Or you see the tool, its cost and limitations, and you keep moving. If you’ve read this far, chances are pretty good you get it. Let me know when your Fix It Sticks arrives. BikeHacks.com is a great site for people who look at the bicycle and say “why don’t we try….” Well worth adding to your reading list. 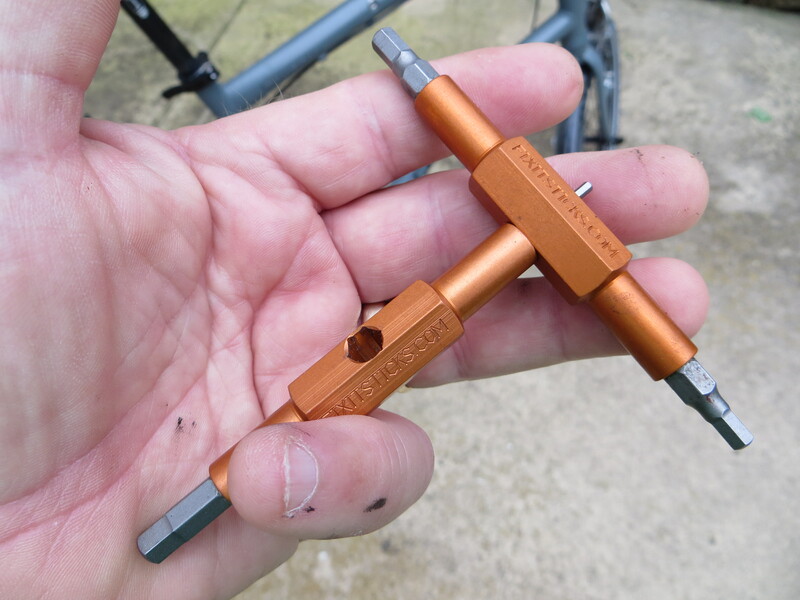 The BikeHacks folks recently discussed an interesting, and discontinued, Fix It Sticks predecessor made by Crescent Tools. The Fix It Sticks site covers the main benefits of the minimal multi-tool right on the homepage. Be sure to watch the video for the philosophy behind the Kickstarter-funded design. Hint: Somebody thinks you’re carrying too many tools. This entry was posted in Equipment and tagged Appleton, Brian Davis, Fix It Sticks, tools, weight comparison, Wisconsin. Bookmark the permalink. Nicely written and illustrated. I seem to need an oddly-small mm for the tilt-adjustment bolt of my American Classic seatposts. Otherwise, it’s 3, 4, 6mm most of the time. Punching holes in pockets or hands is a defect of design, but a simple cap w/ strap or sleeve would solve the former. Wonder how the torque of the tool options compares – I use the long allen key ball-ends for getting my brifters to stay put, but maybe I’m using too much force for their own good. Though a screwdriver doesn’t normally poke backward.